Many of us in India are fond of what we call Indo-Chinese cuisine. 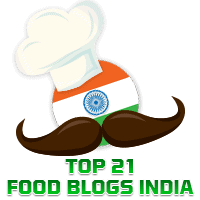 Elsewhere in this blog you will find a few recipes from this type of cuisine, such as Mushroom Pepper Fry, Schezwan Potatoes, and Hakka Mushrooms. You can use home made or store bought Schezwan Sauce for today's recipe. As I had used the store bought Ching's Schezwan Sauce, I sent a picture of this dish to Ching's Secret and they were happy to put this up in their Facebook Page. They even sent me a gift hamper of their products in appreciation. Today's recipe is for the popular Schezwan Rice adapted from this YouTube video from Sanjeev Kapoor Khazana. When adding salt to this dish, please remember that the Schezwan Sauce already has some amount of salt in it. In a wok, heat oil and when it is hot add the finely chopped carrots, capsicum and beans and saute. Add the finely chopped spring onion whites, and a little salt. Mix well.